How does it feel when you find out your hero is a fraud? This is something former England footballer Geoff Thomas has been trying to work out for the past few weeks. Lance Armstrong was actually more than a hero to him. The American cyclist's story was a source of strength during the dark days of his fight against life-threatening leukaemia. And he was the inspiration for setting up his own foundation, then riding the Tour de France route to raise hundreds of thousands of pounds for charity. When the 48-year-old won the Helen Rollason award for "outstanding achievement in the face of adversity" in 2005, it was Armstrong who appeared on a big screen to deliver a tribute. "I look back and that moment in my life will never change," says Thomas, sitting in the kitchen of his house in Barnt Green, a leafy village south of Birmingham. "The award means a lot. It was about what I'd been through and showed I was on the road to achieving something. And Lance was a big part of that." 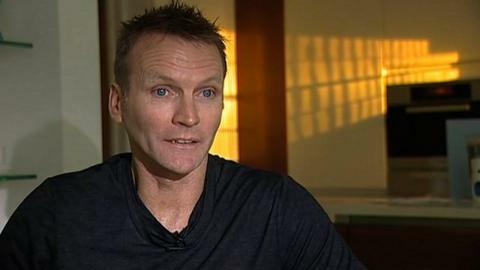 Now Armstrong's story has been exposed as a "big lie", as Thomas puts it, his seven Tour de France victories achieved through "systematic doping" according to the evidence (Usada). "It hurts," the former midfielder admits, shaking his head. "It grates on so many levels." Now he faces the same mixed emotions as so many others who have been touched by cancer and taken solace from Armstrong's inspirational story. Armstrong first became part of Thomas's life in July 2003, a day after the former Crewe, Crystal Palace and Wolves footballer was diagnosed with myeloid leukaemia and given just a 30% chance of living another two years. A friend gave him a copy of the cyclist's autobiography, 'It's Not About the Bike: My Journey Back to Life', which outlines the American's journey from being given a 15% chance of survival from cancer to winning the Tour de France. "I was numb, just looking for positives and this was my first positive," Thomas remembers. "When it was dark and things were going against me, I took strength from his story. As a former sportsman, I admired him for thinking not only about surviving but getting back to the sport he loved. "He wasn't just going to lie there and have any old treatment, he was going to have the best treatment, because he still had this dream of winning the Tour de France." The book has sold millions worldwide and become recommended reading for anyone diagnosed with a terminal illness. A stem cell transplant from his sister Kay in 2004 saved Thomas. When he went into remission, though, he was still inspired by Armstrong, deciding to set up a foundation to raise money for clinical trials into blood cancers. The legendary cyclist had famously set up the Livestrong foundation in 1997 and raised $450m (£280m) for the fight against cancer. Thomas wanted to kick-start his own foundation with a huge fundraiser and turned to his friend Neil Ashton, the Daily Mail journalist, for ideas. "Neil said 'Lance has been there all the time for you, so why not do the Tour de France?'" Thomas had been in remission for only a few months and was "all skin and bones", but took on the challenge of completing the 3,484km Tour route in 21 days, the same time it takes the pros to do the real thing. "It changed my life and was the start of what I call my second life," Thomas says. The starkest memory was the climb up the legendary Col du Galibier, a 2,645m mountain pass in the Alps. "It was snowing and minus three because of the wind chill," he says, thinking back to the day in June 2005. "I was in my shorts and bib, freezing and really struggling, but I just didn't want to stop. "I managed to get to the other side and the sun started to shine. It was a moment that will stay with me forever." The challenge raised £200,000 for his foundation, a feat acknowledged with recognition at the BBC's Sports Personality of the Year awards in December 2005. It was a complete surprise when his hero appeared on the big screen and, in a recorded message, said: "I've been told I'm an inspiration to you, but in truth you are an inspiration to millions. "Keep up the good work and maybe I'll see you out on the road. Livestrong." Thomas remembers: "All of a sudden Lance came up on screen and started talking about me. My heart was pounding. He was a big part of what it was all about." The Manchester-born former footballer had been aware of accusations of doping against Armstrong, but didn't take them seriously at the time. "Like a lot of people who put Lance on a pedestal, I tried to ignore it for a long, long time," he admits. "Coming into each Tour, the French press always seemed to be on his back straight away, but nothing ever came of it. "So I just thought it was always hearsay or people trying to put him off his challenge." The trickle of accusations became a torrent of evidence this year however, as Usada detailed how Armstrong had led the "the most sophisticated, professionalised and successful doping programme that sport has ever seen". Thomas followed the story closely and his idol came crashing down off the pedestal. "What comes out is that Lance was one of the leaders in this - in fact, he was probably the godfather of this cheating," he says. "I played for England nine times, but even in my mind I was an average player. Yet I knew that going out training and doing a little bit more and going on the pitch and trying that bit harder gives you a chance of winning and being recognised. "If I'd known someone alongside me was taking shortcuts, I would have been shouting from the highest point to get rid of him." Suddenly Armstrong's story and book have taken on a very different slant. "Even before he had the illness there's evidence he was taking EPO [blood-boosting hormone erythropoetin]. He won his battle with cancer, fantastic, and went on to win the Tour. "But he's not just gone on to win, he's gone on to earn millions and had big sponsorship deals. "When I think of it more deeply, and I try not to, millions of pounds would have gone out from this country, buying a yellow wristband and sending donations to America. "And you feel that could have been spent more wisely over in this country." Thomas wants to leave behind the memories of how Armstrong helped him in 2003 and move on. "I just want to keep him like he was back in 2003," he says. "He was one of the top six, like Muhammad Ali and Jack Nicklaus, a world great. "But he's damaged now. If I started to think too deeply about where he sent me when I was first diagnosed, it would probably damage those memories as well, so I don't want to go there."